Of all the talks that I used to enjoy with my daughters, it was when I would remind them, how having Mommy and Daddy as their parents, they were lucky because they actually have the best of all worlds with she and I because of our different parenting styles. I always felt that the girls would be exposed to all the necessities of parenting, having a balance of security and comfort, strictness and friendship, and guidance and experience. Our goal was, and should still be, what is in the best interest of our children. Before I continue, I believe that last phrase is important, whether the parents are married, divorced, widowed, never married, or even single parents. And I want to qualify something, I understand and respect all classifications of parents. I myself am an adult child of divorce (great movie and cast by the way “A.C.O.D. ” http://www.imdb.com/title/tt1311060/ ). I know first hand from the child’s perspective what it is like to have only one parent raising a child, or in my mother’s case, children. And I also have long memories of what it was like for my mother to struggle and the lack of resources available to her. 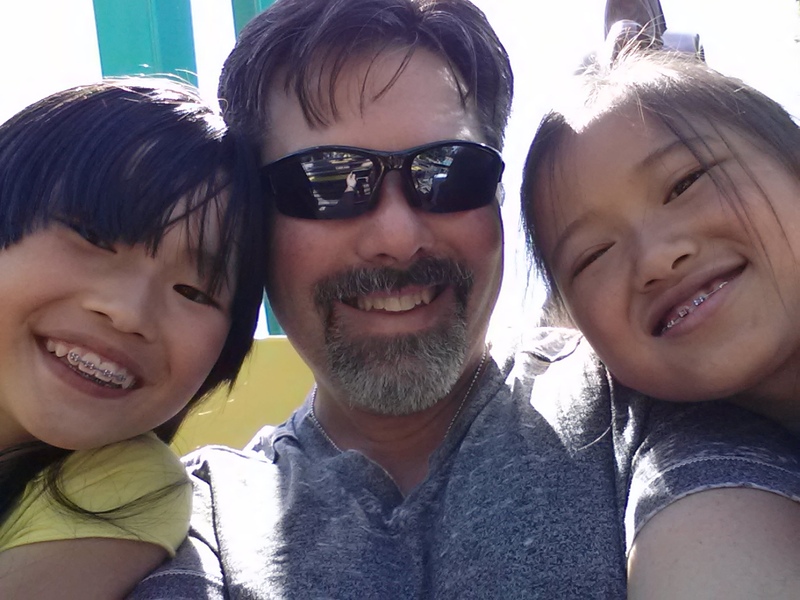 When we adopted our daughters, we agreed on many things, in spite of our parenting style differences. We took vows to make sure that our daughters were raised with religious instruction which of course began with their baptisms, and so far, the first Holy Communions. Up next will be their confirmation. To us, this was important, because without these things already in place, it would make things difficult for them as adults should they choose to get married with the same religion they were baptized in. We have always been supportive of our childrens’ teachers and school. We have always agreed on allowing our daughters to talk to us about anything… ANYTHING. And in the situation of single parenting, I am certain that the belief in doing the best for children is the same priority. And while I may not give enough credit in the following statement: “single parenting is often quite difficult”, I do not mean it to understate that or patronize it. Unlike having two parents raising a child, where when one falls ill, or is unavailable, at least there is someone else to fall back on. But in a single parent situation, that parent is in a “do what has to be done” position without giving any thought to it. But the thing that remains constant throughout all situations of parenting, EVERY parent wants what is best for their children. The single parent makes sure that all doctor and dental appointments are made and kept, all homework is completed and grades are kept up, help the child get through puberty, and prepare for adulthood. The situation is made more stressful in the event of a parent who has passed away for whatever the reason. That parent must deal with the grief from the loss of their spouse, best friend, partner. But that surviving parent must also deal with, and recognize the needs of the children dealing with their loss and grief as well, along with all the other things involved with growing up. Divorce is much more complicated in protecting the children. Care must be given to never allow the children to feel that they are the cause of a divorce. The divorce is between the husband and the wife, not between the parents and the children. In the end, the man and woman will no longer be married, but the father and mother will always be their parents. And just as dealing with loss and grief are an issue for the widow(er)ed parent, there is also a loss and grief that is experienced with divorce when it comes to dealing with children. There are swells of emotions between the parents as they struggle to come to a dissolution of their marriage, all the while, protecting their children. And then of course, there are the concerns, emotions, and actions of the children as they deal with only having two parents, in two separate locations. And for some, divorces involving adopted children stirs up a much stronger emotion. And while I understand the emotions involved, as long as both parents remain just that, parents, then the emotions are misguided. Some belief that an adoptive child involved in the divorce of their child in a sense is going through another form of abandonment. Of course, making reference to the initial adoption that occurred when a biological parent made the painful decision to place the child with a parent or parents who would be able to provide a better life. Abandonment is such an ugly word, and I think if you talk to many older adoptive children, even those who are grown now, find that word offensive. But just as a single parent does daily, parents who divorce, or couples that separate, the priority is the same, keeping what is in the best interest of the child as the focus. The divorce or separation is of the coupling, not of the parenting. The priority of making sure that every sniffle, ache or pain, cavity, puberty issue is addressed does not change. The child still needs to have an education and both parents need to support and make sure that struggles as well as accomplishments are recognized. Hobbies and interests need to continue to be encouraged and supported by both parents. This is called co-parenting. And the irony of co-parenting is this. Is it possible that had co-parenting been the main focus of the relationship (marriage or just coupled), would the break-up ever occurred? Seriously, a break-up does not occur because of the children, and the children should never be made to feel that way. But in making the future of the children the priority, and concentrating on that goal, would it be possible that perhaps the outcomes of the issues leading to the separations would have been handled differently, and yes, cause and effect, perhaps the dissolution may not have happened. Unfortunately, that is something that will never be known. It will just be an “a-ha” moment. But clearly, if you have children in your family unit, any issue whether it be financial, medical, or whatever, not only affects the parents, but also affects the children, and nearly everyone forgets that. For those who have never been in a situation of a family break-up personally, and “knowing a family” having gone through a break-up is not the same at all, it is difficult to understand all the emotions and struggles that have gone into the decision to end a relationship that involves children. In many cases, it is complicated further, if the couple managed to keep all their struggles within the four walls of their home, leading to the shock of the announcement. And of course, follows with massive amounts of unjustified judgment and alienation, all under the guise of what is considered “best for the children.” The only flaw with that thinking, is when both parents in that situation, remain in both their children’s lives, that means that those outside the immediate family unit, to remain in the children’s lives, who have done nothing to deserve any different from those outside the immediate family unit, will still be dealing with both parents. I have seen all kinds of situations in my lifetime involving couples and spouses who have ended their relationships. And combined with my own situation of having been the child of a divorced family, I am especially sensitive to the needs of my daughters and am now driven by my co-parenting responsibilities. Regardless of the distance, I am still involved in my daughters’ medical care, education, interests, and achievements. We have had to become creative in many circumstances in this effort. I have seen successful splits and co-parenting, and I have also witnessed circumstances where legal requirements prevent successful co-parenting that the two parents cannot even be in the same room with each other. I have also witnessed parents forced to deal with each other under the direst of situations, either in an extreme medical crisis or worse, death. And it should not take moments like this to bring two parents together to co-parent. Just as I had no experience as a parent, no experience with adoption, no experience with cancer or the many medical issues I deal with, I can only go by instincts and what I have observed. To do this, means I have to keep an open mind to comments, whether complimentary or critical. Because one thing I think all will agree, children deserve the best opportunities, regardless of the situations.